Members of a United Nations inquiry into the assassination of former Pakistani PM Benazir Bhutto have arrived in Pakistan. Led by Chile's ambassador to the UN, Heraldo Munoz, the team includes a former Indonesian attorney general and a former senior Irish police officer. The inquiry will last six months and investigate the "facts and circumstances" of Ms Bhutto's death. She was killed in December 2007 as she left a party rally in Rawalpindi. The inquiry commission begins its work in Pakistan on Thursday. The visiting team will be supported by staff based in Pakistan. "The staff, working under direction of the commissioners, will gather information, collate relevant material and conduct interviews," a UN statement released on Thursday said. During the visit, the commissioners are scheduled to meet Ms Bhutto's widower, Pakistan's President Asif Ali Zardari, and other senior officials. The commission is scheduled to submit its report to UN Secretary General Ban Ki-moon in six months. The report will be shared with the Pakistani government and the UN Security Council, reports say. The UN says the panel will inquire into the facts and circumstances of the assassination, but stresses that any criminal investigation is Pakistan's responsibility. Apart from Mr Munoz, the other members of the probe team are Marzuki Darusman, the former Indonesian attorney-general, and Peter Fitzgerald, who headed an early inquiry into the assassination of former Lebanese prime minister Rafik Hariri. Earlier this month, Pakistan's Interior Minister Rehman Malik told the BBC his government thought the UN investigation was necessary to find out who was behind the attack. Mr Malik said he believed the assassination was "a big international conspiracy". "Obviously, there might be some actors within Pakistan or within the region, but we want really to expose the whole conspiracy, because we think that this was a kind of a beginning of an attempt to Balkanise Pakistan." Pakistani Taliban leader Baitullah Mehsud, accused by the last government in Pakistan of being behind the assassination, is the target of a military offensive and his militant network has hit back with retaliatory suicide attacks. The Taliban commander has denied having anything to do with Ms Bhutto's killing. Her assassination left questions unresolved for many people in Pakistan, but especially her own party, which is now in government. 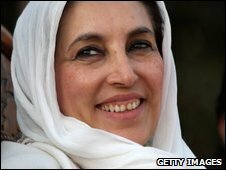 After she had narrowly escaped a double suicide bombing on the day of her return to Pakistan from self-imposed exile in October 2007, she accused what she called "enemies" and "rogue elements" in the government led by President Pervez Musharraf and in the intelligence agencies of plotting to kill her. 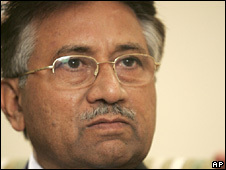 Former Pakistani President Pervez Musharraf blamed al-Qaeda-linked militants for the attack and refused to seek a UN investigation. He invited police from London's Scotland Yard to assist in the inquiry into her death. In their report, the British detectives said they believed she died due to a severe head injury sustained as a consequence of a bomb blast. The Pakistani investigation into her death concluded that a lone attacker fired shots at Ms Bhutto before detonating explosives, but said that bullets were not the cause of death. Ms Bhutto's Pakistan People's Party (PPP) rejected both these versions, claiming adequate security had not been provided for Ms Bhutto, and called for a wider inquiry by the UN to establish the identity and motives of the assassins. A PPP-led coalition defeated Mr Musharraf's allies in general elections last year. Ms Bhutto, twice prime minister of Pakistan, lived in self-imposed exile after Mr Musharraf assumed power in 1999. In October 2007, she returned to Pakistan to campaign for the PPP in parliamentary and provincial elections - the first to be held since President Musharraf resigned as head of the army and became a civilian leader. Shortly after her return, she survived bomb attacks on her convoy in Karachi that killed more than 100 people. But Ms Bhutto continued to campaign and was assassinated on 27 December at a PPP rally in Rawalpindi. She was standing upright in her armoured vehicle, with her head exposed above the open roof escape hatch, waving to the crowd when an attacker opened fire. Seconds later, a bomb was set off at the scene which left some 20 other people dead.